Yesterday saw two relatively high profile releases. First a two disc archival release of a Keith Jarrett concert in Japan from 1979. 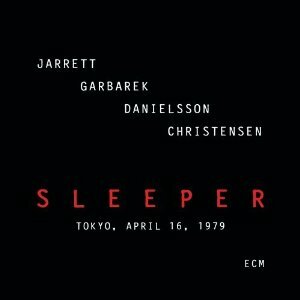 Sleeper showcases Jarrett with Jan Garbarek on saxophones, Palle Danielsson on bass and Jon Christensen on drums, his ‘European Quartet’ (to distinguish it from Jarrett’s other 70’s quartet, his ‘American Quartet’ with Dewey Redman on saxophone, Charlie Haden on bass and Paul Motian). Jarrett’s recent career has been filled with albums I find sort of disappointing (either tending towards aimless abstraction as many recent solo piano performances have been or rendered practically unlistenable by his loud, frequent, and very well miked vocalizations), but this is the most enjoyable Jarrett release in recent memory. Perhaps the most enjoyable since the days of the two great quartets themselves. This is a band captured in its prime, both exciting and, luckily, not so dense as to be unaccessible. The released music has been expanded and the sound cleaned up considerably. This new release sounds excellent. A spectacular addition to a legendary pianist’s output. Also released was Branford Marsalis’ new album, ‘Four MF’s playin’ Tunes‘. Before speaking briefly about the music, a word of warning. My review is based on a somewhat truncated listening of the album because the iTunes download, which I unfortunately opted for over the the cd, is marred by a technical glitch. The last minute plus of the song ‘Maestro’ and the first ten seconds of the one that follows, ‘Teo’, are comprised of repeated skipping. I trust that iTunes will adress the issue in time. Until then, I can only comment on the music that successfully made it to my computer. This is the first Branford Marsalis quartet album since longtime drummer Jeff ‘Tain’ Watts left the band. I saw the band shortly after his departure and remember being highly impressed with his replacement, the young Justin Faulkner. He did a mean Tain Watts impression, and when talking about as skilled a drummer as Tain, that’s pretty high praise. Now, a year or two down the line, the band sounds comfortable and together. That has always been a real strength for this band; with the one exception of the switch in drummers, they have been playing together for more than a decade now. They are comfortable with each other and all on the same page when it comes to making music. This delivers like pretty much every Branford Marsalis quartet album delivers. There’s an intense burner or two (the aptly titled ‘Whiplash’ comes to mind), there’s a ballad (the next track, ‘As Summer Slips Into Autumn’). Technical wizardry is on display throughout. It’s a breath of fresh air compared to Branford and his longtime pianist Joey Calderazzo’s last collaboration, the duet album ‘Songs of Melancholy and Mirth’, which had a lot more melancholy than mirth. To my ears, not as rambunctious an album as the last quartet outing, ‘Metamorphosen’, or their spectacular take on Coltrane’s ‘A Love Supreme’, but a highly enjoyable album for sure.